Cape Town Palms Bed and Breakfast / Self Catering Guest House is a luxury Villa located just up the coast from Cape Towns CBD in the sage and quiet suburb of Milnerton. Walking distance to Milnerton’s pristine beach, local bars and restaurants, in addition to the renowned Milnerton Links Golf Course. 7 Magnificent En-Suite Rooms, a large Salt Water Swimming Pool, and Braai (BBQ) / Spit-Braai facilities with Lapa make this Villa ideal for Families, Groups, Backpackers, as well as the discerning Business Man. Self-Catering or Bed and Breakfast. We furthermore provide Service Par-Excellence and Efficiency in a warm homely atmosphere that will contribute to a positive guest experience. 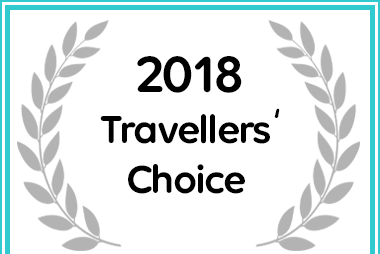 Travellers' Choice Award for 2018. KITCHEN: Open plan Gourmet Kitchen fitted with fridge, Freezer, Oven, and Hob, microwave and dishwasher. BEDROOMS:All our rooms equipped with Tvs, DSTV channels, and furnished with Oak built in cupboards. DINING ROOM: Our dining room is equipped with ADSL for all your BUSINESS REQUIREMENTS. BARBEQUE: We have an outside, under-cover Barbeque – Spit Braai Area for South African style entertainment. LAPPA: Outside Lappa and seating for 10-12 people, with outside Bar. Perfect entertainment area for an outside Barbeque or general socializing. SWIMMING POOL: Large Salt Water Swimming Pool with deck and deck chairs. Great for enjoying the South African Sun. LOUNGE: Our main lounge area features a warm fireplace for those Cold Winter Nights.